Location. A 20-mile-long belt of gold mineralization runs through western Amador County. On the belt, a portion of the Mother Lode, are the towns of Jackson, Sutter Creek, Amador City, Drytown, and Plymouth. Because of the uniform nature of the gold mineralization along this belt, the several districts and sub-districts have been grouped together here under a Jackson-Plymouth heading. History. This entire belt was settled early in the gold rush when the streams were placer-mined. Jackson was settled by California Spanish at least as early as 1849. It was first known as Bottles, but the name was soon changed in honor of Colonel Alden Jackson. Sutter Creek was named for Captain John A. Sutter who visited the region in 1846. Amador City was settled in 1851 and Plymouth in 1852. Drytown flourished from 1848 until 1857 when rich placer deposits were worked. Most of the important lode deposits were discovered during the 1850s. The Argonaut mine was first developed in 1850, the South Spring Hill and Lincoln in 1851, the Plymouth in 1852, the Original Amador and Keystone in 1853, the Central Eureka in 1855 and the Kennedy in 1856. Lode mining developed into a major industry that was to last 90 years. By 1875 mines such as the Keystone, South Spring Hill, Oneida, Old Eureka, and Plymouth had become large and highly profitable operations. However, the Argonaut, Kennedy, Central Eureka, Bunker Hill, Fremont-Gover, and Lincoln Cons. 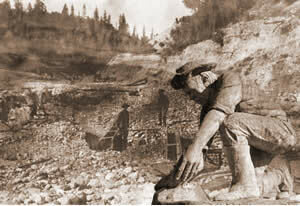 (Lincoln, Wildman, and Mahoney), major gold sources of a later date, did not become important until the 1880s and 1890s. The properties constituting the Plymouth Cons. mine were consolidated in 1883, the Kennedy Mining and Milling Company was organized in 1885, and the Argonaut Mining Company in 1893. From the 1890s until 1942, this belt was one of the more important gold-mining districts in the nation. The value of production ranged from $2 million to $4 million annually. Several thousand miners were employed, many of whom were of Italian, Austrian, and Serbian extraction. There were two noted lawsuits between the Argonaut and Kennedy mines in 1894 and 1897 in which the former accused the latter of conducting mining operations in their ground. Several disastrous fires have occurred in the district, including one at the Argonaut mine in 1922 that caused the loss of 47 lives. This fire began on the 3350-foot level of the mine and trapped a whole shift of miners on the 4650-foot and 4800-foot levels. As mining operations progressed to greater and greater depths, costs increased, especially because in some mines, the grade of ore decreased at depth and it became necessary to mine larger amounts. A number of immense mills were erected, including those at the Kennedy mine, which employed 100 "stamps" each, one at the South Eureka with 80 "stamps" and those at the Argonaut and Oneida, which had 60 "stamps" each. The ground became extremely heavy at depth and required much timbering. As costs continued to increase during the early 1900s and were accelerated during World War I, a number of mines were shut down. The South Spring Hill mine was shut down in 1902, the Lincoln Cons., in 1912, the Oneida and Zeila in 1914, the South Eureka in 1917, and the Bunker Hill and Treasure in 1922. However, the district continued to yield large amounts of gold as the Argonaut, Kennedy, Central Eureka and others increased the size of their operations. The Old Eureka and Central Eureka merged in 1924; the new operation was known as the Central Eureka, for a time as the Hetty Green, as it was controlled by that financier. The district's output increased after the 1934 rise in the price of gold. The veins continued to be developed at greater and greater depths until the Argonaut and Kennedy became the deepest mines in the country. Each has a vertical depth of more than 5900 feet. The Central Eureka, South Eureka, and Plymouth Cons. are more than 4000 feet deep. All of the mines were shut down soon after the beginning of World War II. The Central Eureka mine was reopened in 1945, but because of greatly increased costs it was shut down again in 1953. This was the last active major gold mine on the Mother Lode. Jackson-Plymouth was the most productive district of the Mother Lode belt, with a total output estimated by the author at about $180 million. If large-scale gold mining were ever to be done here again, it would be most desirable to consolidate the major mines and operate them as a unit. Some are connected underground and all produced considerable water. The remaining surface plant of the Kennedy mine is now a museum. The large wooden tailing wheels and the superintendent's office at this mine, long noted landmarks, are historical displays. Several other distinctive old mine buildings have been preserved, including the Keystone mine office, which is a motel, and the Zeila office, which is a private home. Geology. The gold deposits are in a north- and northwest-trending mile-wide belt of gray to black slate of the Mariposa Formation (Upper Jurassic), with some interbedded coarse and occasionally sheared conglomerate and minor sandy and gritty layers. Massive greenstone of the Logtown Ridge Formation (Upper Jurassic) lies west of the belt of Mariposa Formation slate. Metasedimentary rocks, chiefly graphitic schist, metachert and amphibolite schist of the Calaveras Formation (Carboniferous to Permian) are to the east.